By now you have reviewed the 2019 Food on Demand Study results, but what are you doing with the information? Where do you go from here? “To the victor goes the wallet” is an easy concept to understand but harder to make tangible. How can you make sure that you are the victor? Currently, DoorDash, Grubhub and Uber Eats are still winning. But as we know, the landscape is changing rapidly. For example, Waitr’s acquisition of Bite Squad effectively doubled the market share of both companies, and nobody has figured out how to make money yet. This landscape is going to continue to change drastically, so the opportunities are truly endless. You’re not as powerless as you think. It feels now like you have to be in this game, but this is only the beginning. There are steps you can take right now to make sure you have a stong handle on what is best for your business. I would be clear on my goals and objectives, and then I would identify the KPIs that I need to hit in order to achieve them. Then I would focus on hitting those KPIs and making sure that my delivery partner is as well. Closely monitor the delivery services you partner with and continually evaluate the value they bring you as well as what is best for your business. It doesn’t take much for an upset, so be clear on what is best for you and be ready to make changes as needed. Be VERY sure that you deliver on your promises to both restaurants and consumers. 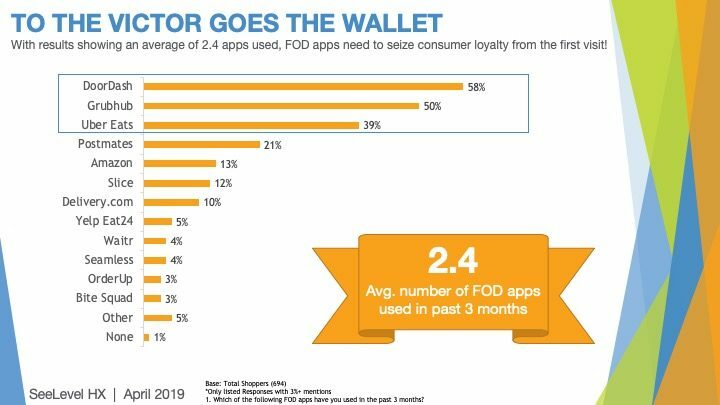 Consumers are already using 2.4 apps on average. If you don’t deliver on a consistent basis, you will lose market share quickly. Monitor your KPIs and know where you stand relative to your competitors. You MUST have these features to even get in the game. But now, you have to get creative. Monitor your competitors often, continually evaluate the landscape and be clear about your own strengths and weaknesses. This will allow you to take advantage of the opportunities in the landscape that will add the most value. When you are clear on these, you can craft your marketing messages accordingly. You know who you are vis a vis the landscape, and your ability to deliver on those strengths will resonate with your customers. Find out how you can be the victor.